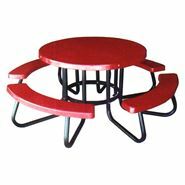 Round Picnic Tables: Metal, Concrete, Wood, Recycled Plastic - Picnic Table Store-Commercial grade quality-lowest price. 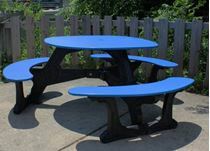 Round picnic tables are just the right designed table for schools, parks, commercial buildings and restaurant outdoor seating. These functional tables seat eight adults on four benches in a small footprint. Our selection is huge compared to any other competitor! 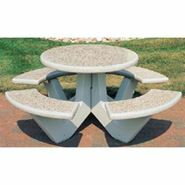 We have round thermoplastic picnic tables, concrete, fiberglass, plastisol, and ADA compliant picnic tables. We have the three mounting options available: portable, surface mount, or in-ground (see below). Round picnic tables can be purchased in our store with two, three, or four seats for any group gathering. Our personal and prompt service professionals wait to serve you. Want to learn more? Study our resource guides! 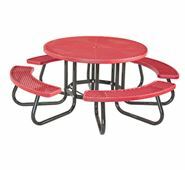 46” Round Recycled Plastic Picnic Table with Easy Access, 212 lbs. Which mounting option is best for my business? A portable frame is ideal if you do not have a place to permanently install the picnic table. Portable frame are a non-permanent solution, making it possible to move the picnic table. Portable frame can sit on a flat surface without anchoring or you can make temporary anchors for these portable round picnic tables. Surface mounting is a semi-permanent solution. If you would like to leave the possibility of moving your picnic table some day, surface mounted frames are ideal. This method offers more protection from vandalism; so surface mounting is great if your picnic table will be going onto a concrete surface. Surface mounting round picnic tables requires a steel plate to be bolted onto a concrete or asphalt surface. 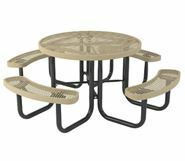 Round picnic tables are newer in the evolution of the picnic table styles. With the ability to form metals, concrete, wood, plastic and wood round picnic tables have found their way into schools, eating areas, restaurants, corporate meeting areas, parks and every place a picnic table works for people. The round shape provides the function to seat eight people comfortablly to eat, talk and enjoy events. We do offer the largest selection of round picnic tables...but by now you know that!